Natalie’s 1-Sentence Synopsis: Spanning more than 40 years, Little Gale Gumbo tells the story of New Orleanian Camille Bergeron as she uproots her two young daughters and moves to a tiny island in Maine to escape an abusive marriage. I’m a sucker for Southern fiction and even though Camille and her girls leave New Orleans within the first few chapters, the novel is infused with enough southern references, figures of speech, voodoo, and recipes to leave me feeling sated. Little Gale Gumbo pulled me right in and was a quick read. Camille has two daughters by her husband–headstrong Dahlia and needy Josie–and they all fight their own battles within the novel. Told in flashbacks, readers get a sense of the family dynamic and Marks’s characterization of Dahlia fueled my dislike of the character. She purposely hurt her younger sister again and again, and I couldn’t understand why men were drawn to her. Inferior Josie continued to pine after the son of their new landlord for more than 20 years, while her sister toyed with him mercilessly. Past hurts, buried secrets, and old fears all come to a head with the reappearance and subsequent death of Charlie Bergeron. The sisters, now adults, must come to terms with their past, their individual actions, and their future. Part of NAL’s Accent Collection, this novel deals with “…subjects close to a woman’s heart, from friendship to family…”. 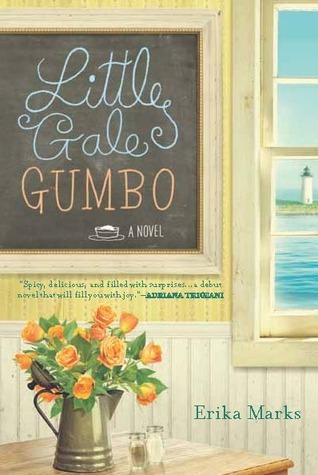 Little Gale Gumbo also comes with several recipes and a discussion questions for book groups. I’m looking forward to trying out the recipe for pralines and will post my attempts in conjunction with a Weekend Cooking post soon. I’m intrigued! Adding it to my list. Nice review. You can take the Southerner out of the South, but you can’t take the South out of the Southerner. This sounds like a book I’d enjoy. i’m a sucker for southern fiction too! i’ll have to add this one to my wishlist. Another great review Nat. Family dramas (apart from Eastenders, of course) never seem to pull me in. Too much drama in real life, I guess. But the sound of southern cuisine might make this palatable. Get it? Dishy´s last blog post ..The Making of a Gingerbread House. You’ve got MY BOOK RIGHT THERE ON THE SIDEBAR!!!! I like southern fiction too, you can’t take the southern out of the girl no matter where she lives!